Twenty-six stories high reaching a height of 122 meters, the Sun Life Insurance Company building created in three stages beginning in 1913, towers over a monument in Square Dorchester in Montreal, Quebec. The gardens in Square Dorchester are beautiful where they surround a monument honoring men who fought in the Boer War. Square Dorchester is the heart of Montreal, Quebec where visitors begin exploring the core of downtown, often using the monument as a meeting place. Originally, Square Dorchester was home to the Montreal Catholic Cemetery between the years of 1799 to 1854. Monument in Square Dorchester backdropped by the Sun Life Building in Centre Ville, Montreal city, Quebec, Canada. 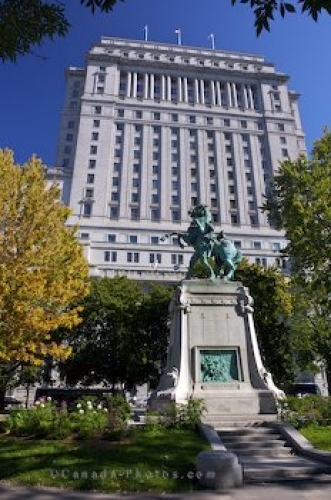 Picture of a monument in Square Dorchester in Montreal, Quebec and the Sun Life Building.